Sometimes, there are books that pushes you farther than it should be pushing you (or at least me anyway) in a normally perfect, ordinary way. Well, this was that kind of book that really kept my interest to the limits of my, well, very limited frame of mind. I am quite sure and really believe that I was never meant for greatness nor vagueness. I am SO ordinary (although there are times that I actually feel and believe that I am extraordinary din pala haha) it's so boring. Blame it on the past. Anyway, the book is so beautiful and nice and wonderful and life-awakening-but-not-in-a-preachy-manner (most of the times) nauubusan na ako ng pang-describe.hehe. Even in my early-20-years, I've always digged Young Adult Literature. Kasi you can never go wrong with it. I was so affected that I started mulling over my present-state-of-life again. As if I never get to do that often. Pero in a different light this time. After reading it, i desperately wanted to start a new hobby, one that's interesting it could actually take me years to accomplish it. I guess the point really is having a goal that is different than your any other goals in life. 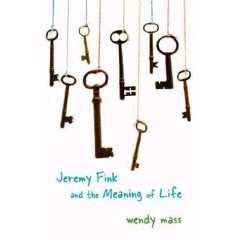 And i absolutely agree with Jeremy Fink's father's idea that we all do need a little adventure in this life. Hmm.Sana sa next life ko ay magawa ko din yun. haha. i don't want to encourage everyone to read it because we have different views and all, what I want though, is if you ever get a chance to read it, just do. Wala pa namang namatay dahil lang sa pagbabasa ng isang sinuggest di ba? I think. After all, it's not everyday that you give thoughts on what the meaning of life is. Sana may magregalo nito sakin someday, somehow.